This is a tutorial on how to setup a Shadowsocks server on DigitalOcean. We have another tutorial on setting a Shadowsocks server on Amazon AWS EC2 if you are interested. While setting up Shadowsocks on DigitalOcean can be quite easy and might only take 20 minutes, this process does require you have some technical skills, such as using Linux commands, SSH to a remote Linux server, using command line text editor (such as vi) to edit files etc. If these sound too difficult to you, you can consider using Shadowsocks alternatives, such as a VPN. If you are looking for a VPN to be used in China, please check out our recommended VPNs for China Internet users. DigitalOcean is a cloud hosting provider that became very popular in recent years. It offers SSD-only servers with a low price, which starts at $5 per month. Compared to Amazon AWS EC2, setting up a Shadowsocks server on Digital Ocean is easier, because you can skip things such as setting up a security group, configuring elastic IP addresses etc. From our experience, you can choose the cheapest DigitalOcean hosting plan ($5/month) to host your Shadowsocks server and it works pretty well. For this plan, you get a 512 MB RAM, 20 GB SSD disk space and 1TB monthly transfer. For OS, we will use Ubuntu in this tutorial. 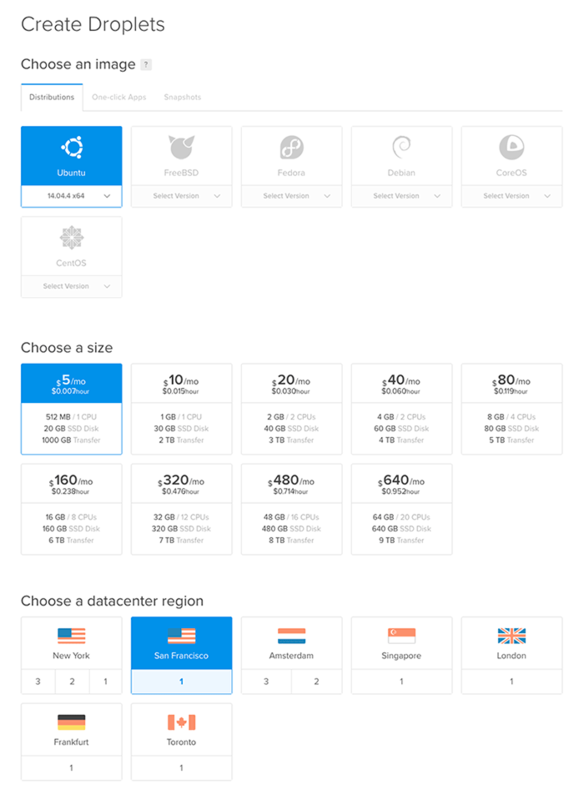 For server location, if you will use Shadowsocks from China, we recommend choosing DigitalOcean’s San Francisco datacenter, because it seems to offer the best speed. If you don’t have a DigitalOcean account yet, first you should sign up to get one. For new users, DigitalOcean offers a free $10 credit. Click on this link to sign up at DigitalOcean to get the $10 credit. Choose an image: select Ubuntu. Then click on the “Create” button to create your droplet. Once it’s done, you will be able to see your newly created droplet listed under the Droplets section of your DigitalOcean control panel. Along with the name of the droplet, you will also see a IP address for this droplet. You can use this IP address to SSH to your DigitalOcean server. Later on you will also use this IP address to configure your Shadowsocks client. Now that we have a Digital Ocean server running, we need to connect to it and set up Shadowsocks. You can connect to the server in two ways: using the web based access console provided by DigitalOcean, or SSH to it using a terminal on your local computer. We’d recommend using SSH because with the access console it’s pretty difficult to do copy and paste etc. If you don’t see any error message in the Shadowsocks log file, then you are fine. In the future, if you want to stop the Shadowsocks server, use this command: “ssserver -c /etc/shadowsocks.json -d stop”. If you want to restart the Shadowsocks server, use this command: “ssserver -c /etc/shadowsocks.json -d restart”. Cool. Now we have a Shadowsocks server running on DigitalOcean! If you want to stop here, it’s totally fine. 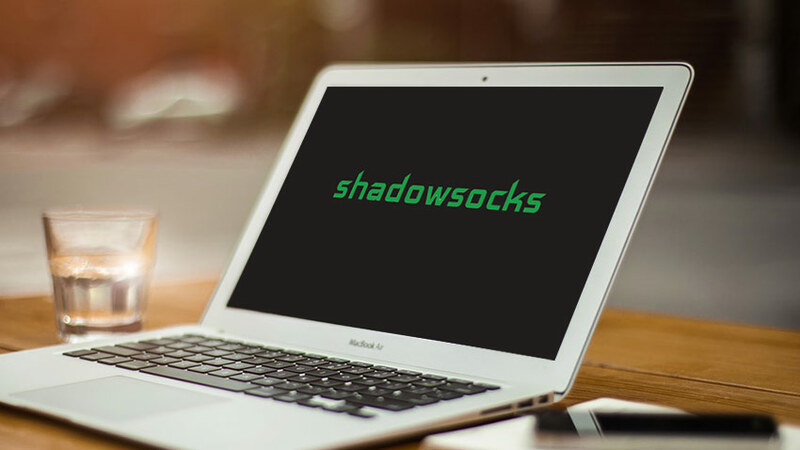 You can now enjoy your newly created Shadowsocks server on DigitalOcean and use it as you wish. But let’s continue with some tips for Shadowsocks server optimization. Now that you have successfully set up a Shadowsocks server on DigitalOcean, you can connect to it using a Shadowsocks client. Please refer to Shadowsocks.org’s official documents on client set up etc. It’d be too much for us to include the details here. When you configure your client, just make sure to use the correct IP address, port number, password and the encryption methods that you have set up in the Shadowsocks config file. For Shadowsocks server optimization, there used to be another trick, which is to use a third-party software called ServerSpeeder to speed up the server. We have seen big speed boost after turning on ServerSpeeder on our Shadowsocks server. However, unfortunately ServerSpeeder stopped accepting new registrations and installation in early 2016. If you have a old ServerSpeeder account that still allows you to install on new servers, you should definitely install it on your DigitalOcean droplet where your Shadowsocks server is hosted. Another trick for using ServerSpeeder is that it only supports a limited number of Linux kernels. The kernel of your server might be too new for ServerSpeeder to support. To get around this problem (given that you indeed can install ServerSpeeder on your server), you can change the kernel to an old one. To do so, you can go to DigitalOcean’s Droplet control panel and click on the “Kernel” link to change the kernel to a different one.